Those screwdriver-wielding destructacons at iFixit have posted their teardown of the brand-new iMac with Retina 5K Display. On a scale of 1 to 10, it has a repairability score of 5, which is the same as its lower-resolution sibling, the non-Retina 27-inch iMac. The new Retina 5K iMac (just announced Thursday) has the same RAM replacement slots as the rest of the iMac lineup, so you can upgrade the RAM yourself without having to take the entire thing apart. iFixit has a helpful guide created for the last generation that you can follow. 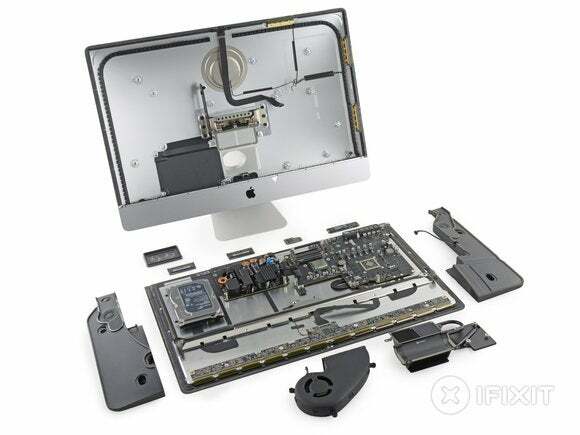 If you are bold enough to slice open the iMac itself, iFixit found you can still replace the hard drive and even the CPU, since it isn’t soldered to the logic board. But taping it back up when you’re done could prove difficult.